The beginning of September in Edinburgh always takes me by surprise. After a month of chaos and crowds and revelry the streets are strangely quiet, the nights descend with an unfamiliar chill, and the shaft of sunlight that floods our bedroom every evening vanishes almost before it arrives. I guess it stands to reason that summer has been on its way out for a while, but somehow that fact tends to get lost in all the commotion so that when September does arrive it just feels so abrupt, like someone has flipped the big seasonal switch in the sky. Although I appreciate the delights of fall as much as the next person, and realize that it promises much to look forward to in the food department, try as I might I just can’t shake the nagging thought that I should have made more of summer while it was here, since at these latitudes, it’s only a matter of weeks until we’ll be lugging out the stewpots and casserole dishes and firing up the oven in preparation for another long, dark winter. Luckily, over the past few days we’ve been given a reprieve. In fact, we’ve had more warm sunny days in a row than we’ve had since, oh, April. It couldn’t have come at a better time, actually, desperate as I am to cling to summer for just a little bit longer, and realizing it may be the season’s swan song I seized the chance to attack some of the backlog of warm-weather recipes I never got around to making. The cold soups in particular were tempting me, and over the past week we’ve enjoyed Ximena’s fantastic gazpacho, a pungent ajo blanco that I’m fairly certain everyone I talked to the next day knew I had eaten (if only I had seen this version first! ), and a lovely puree of corn and basil that would have been even lovelier if the corn I bought actually had some flavor. We also had a soup that I’ve been meaning to write about here for ages – probably since starting this blog, in fact – which is so simple and so refreshing and thus so perfect for summer that it’s really criminal I never have until now. And telling you about this soup, in fact, is really the excuse I needed to say a few words about Bulgaria. Although you’ve all politely refrained from prying, for two and half years I have been mum on the whole issue of how Bulgaria came to be listed among the places Manuel and I have called home over the years. You’ve heard more than you probably ever wanted to about Spain, Ireland, Germany, California, Seattle and New Orleans, while poor Bulgaria has been sitting forgotten in the corner like the crazy old uncle everyone avoids at family reunions. In all fairness, though, I tend to write about what I know, and in fact I don’t know that much about Bulgaria since it wasn’t me who lived there, it was the other half of my household. Manuel moved to Bulgaria in 1988, when he was twelve. At that age it obviously wasn’t his decision; it happened because his mother married a Bulgarian she met through her job in Germany, and he took them back with him to live in Sofia. It was, I am told, a rocky time to be there, what with the downfall of communism and food shortages and all, and the fact that the marriage was soon on the rocks didn’t really help matters either. They did manage to make it work for four years, though, during which time Manuel integrated himself pretty well in his strange new surroundings, learning important things like the language, that Bulgarian girls were just as mysterious as their German counterparts, and that bribery was an art all but necessary to live in any kind of comfort. He also, of course, learned quite a bit about Bulgarian food. In fact, although those four years were, as he says, some of the most challenging, confusing and difficult of his life, the one thing that seems to have left an imprint on his psyche greater than all the hardship was what he ate. Now, I have to stop for a minute and explain that this is a man who has always amazed me by how unattached he is to the foods of his childhood. While there are a couple of exceptions, namely a spaghetti Bolognese recipe from his mother that features curry powder (!) and a strange packaged dessert from Dr. Oetker called Rotweincreme (a mousse-like substance made with red wine he has been bugging me to duplicate for years, so if anyone has a recipe, please do speak up), for the most part, when he waxes lyrical about food it concerns things he’s developed a taste for as an adult; e.g. nachos, jerk, tiramisu and anything with peanut sauce. Bulgarian food, however, brings out something in him nothing else does. Whether he’s recalling the cheese-stuffed pastries he used to buy on his way home from school, the eggplant dip and walnut baklava his step-grandmother made, the simple country salads and spindly feta-stuffed peppers that were a staple of every meal, his eyes get all misty as if each one were triggering him to relive the experience all over again. Many of his best-ever food memories come from that time as well, and time and time again he’ll eat something – anything from yogurt to vegetables to desserts – and tell me that while good, it really can’t hold a candle to the way it tasted in Bulgaria. In fact, his connection to this food seems far deeper than four years should account for; the only thing I can figure is that the intensity of experience of those four years was so profound that it shaped not only his perception of the food at the time but the way he views it in his memory. well as a prelude to stews and casseroles and all manner of rib-sticking fall fare too. In fact, give us a week or two and I’m sure I’ll be able to confirm that for you firsthand. In a blender combine about 2/3 of the diced cucumber, the yogurt, garlic, mint and water and blend until completely smooth. Add more water if necessary – the consistency should be like thin cream. Transfer to a lidded container and add salt and lemon juice to taste. Don’t be shy with either – the soup should be pleasantly tangy and salty. Stir in the reserved diced cucumber and chill, covered, for at least an hour to allow the flavors to blend. Divide among bowls for serving, and top each one with a garnish of toasted almond slices. Serve cold. Good news! The October issue of Food and Travel is now out, and inside you’ll find my full report on why Belgium should be your next food destination. In fact, this issue is nothing short of a food blogger extravaganza – the supplement on Singapore packaged with the magazine was written by none other than Chubby Hubby and his wife S (aka Aun Koh and Su-Lyn Tan)! If you’re in the UK you’ll find it on newsstand shelves now; U.S. and European availability should follow within a couple of weeks. Oh, and I should probably warn you, later this week I’m headed to the US for a much-needed vacation, so don’t worry if I’m gone a little longer than usual. Rest assured that I’ll be eating well, and I’ll see you when I return! I will be looking for your Food and Travel issue. As we are still boiling and humid in Pittsburgh, this is just the sort of thing one wants to eat. We won’t be cooling off hereuntil sometime next month, and though I’ve failed to put anything up this summer, I’m still looking forward to the coolth with some impatience.Cucumber and yogurt seem to have a natural affinity, don’t they? You see them together in Indian raitas and Greek dishes as well. Cool and smooth and just a little sour. Lovely. Those Dr. Oetker packages are convenient – but since they sell their Rotweincreme in little containers (right next to the puddings and yoghurts) I doubt many people actually make it at home ;)Here a couple of recipes:300 ml	red wine100 ml	currant juice (cherry-juice works as a substitute) 100 g	sugar 6 sheets gelatin 300 ml	cream, whippedSoak the gelatin in water. Meanwhile heat the wine, juice and sugar on low heat until the sugar is dissolved. Add the gelatin, let cool for a while and add the whipped cream.——250ml red wine	(or grape juice, for people who don’t like wine)250ml water100g sugar1/2 lemon1 egg yolk40g cornstarch150g cream Add wine, water, sugar and the juice of half a lemon to a pot. Add the corn starch and the egg yolk and heat over low heat (stir constantly) until the mixture thickens (5-10mins). Then pour in a bowl and place the bowl in (cold) water to chill. Whip the cream and add to the chilled mixture – fill in wine glasses. Can be made a day or two in advance. We called "Cacik" not tarator. Our (Turkish – Ottoman) tarator contains bread crumbs, wallnut, lemon juice, yogurt, garlic ect. Congratulations! I wonder if I can find a copy of the magazine here. Enjoy your vacation! Hi Melissa – I enjoyed your beautiful artcile (as well as Aun & Su-Lyn’s gorgeous guide). Take care and have a lovely time back home, the soup looks absolutely delicious! As you correctly wrote, this tarator doesn’t have anything to do with the turkish tarator, but all the more with what we call "cacik". It is the exact same thing, did you ever eat it in Turkey? How funny, same dish, different name, that happens to be the name of something else…. confusion! oh, we´re still in deep summer here, never fear, and beginning to tire of the gazpacho (gasp! ), so this is definitely one to try this week. This is great.We also have tarator in Albania. It is almost the same recipe, but we don’t use herbs. We just sprinkle generously olive oil and salt over the mixture of yogurt, garlic and cucumber.Another version is that with grilled (fried) zucchini instead of cucumber. In this case zucchinis are thinly sliced and grilled (fried) and added to the yogurt. Again olive oil and salt are a must. 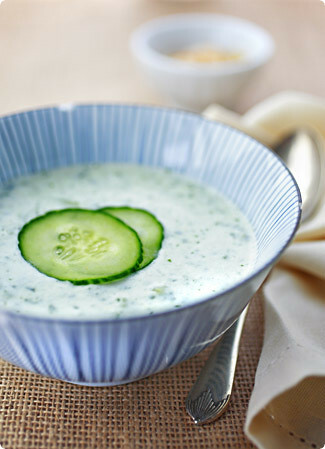 I love yogurt and cucumber soups, though I’ve never heard of tarator–I’m glad to discover it has a name! One of my local bookstores sometimes stocks UK food mags–I’ll keep my eyes open for this issue so I can read your story. Congrats! And have a great holiday! Hallo from Bulgaria!I’m happy to know that someone likes our dishes. That soup looks super refreshing. I’ll have to try it in these last days of warm weather. Congratulations Melissa on the publication. The soup looks fantastic. Enjoy the vacation! This almost makes me wish for more hot weather so I can enjoy it properly. Almost. Maybe I’ll just take your suggestion of using it as a refreshing starter before a hearty meal. Lovely recipe, gorgeous photo — and I can’t wait to pick up a copy of your new article! I wonder why is that one called Bulgarian?It’s the same with our Albanian tarator..Maybe they should change the name into Balcan Tarator.Congratulations on the great site anyway! I’m doing the same, summer end recettes. Winter can wait. i love yogurt in all it’s different avatars! i make some variation of yogurt soup pretty much everyday. in the hot and humid south of india, we need it badly. you can take a girl out of south india, but you cant take the south india out of the girl..etc etc..also, no need to give it up when it becomes chillier. you can substitute carrot for cucumber.sometimes, the yogurt soup(if thinned with water) can be thickened with eggs(as the turks do) and made tart with lemon juice. (georgians use pomegranate as a souring agent) interestingly, in india where eggs arent used, besan is used to thicken similar yogurt soup. in punjab, they use fenugreek(another fav in georgia..the similarities between georgian and indian cuisine never ceases to amaze me!) and red chilli powder for spiciness. in the south, they use coconut, cumin and green chillies with the ground coconut paste acting as a thickener.as you are, like me, somewhat intrigued by georgian cuisine, you probably already know that they have a similar yogurt soup in georgia. blanched spinach leaves go well instead of cucumber! a rather thick version of a spicy, tart yogurt soup is also great as a salad dressing. its just a matter of ratio between yogurt and veggies!thank you for this post. the simple pleasures of life are the easiest. I love tarator soup. We spent 10 days in Bulgaria last summer visiting friends who live there (in both Sofia and Nesebar) and tarator was a staple at every meal. I was also a big fan of the chopska salad. Driving through the countryside from Sofia to Nesebar (on the Black Sea) the bounty of the land was evident, miles and miles of tomatoes, orchards, sunflowers and the food we ate was always fresh and simple. Funny you mention Bulgaria. I have recently realized one of my favorite brands of, well, assorted things in jars (peppers, pickled squash, a few condiments, and an eggplant dip) are imported from there. I am excited to learn more about their food, thanks! oh deliciousness. My Persian friend makes something very similar as an appetizer and she adds raising and walnuts: packed full of flavor and crunch.